Annuals; (not glaucous), usually sparsely to densely hispid or hirsute, rarely subglabrate. Stems erect, unbranched or branched distally, (0.8-)2-10(-16) dm, at least sparsely hirsute basally. Basal leaves soon withered. Cauline leaves petiolate (proximal and median 0.5-3 cm); blade lanceolate to oblong or oblanceolate, pinnatifid, 2-12 cm × 5-50 mm, (smaller with fewer lobes distally), margins of lateral lobes dentate or entire. Racemes without a terminal cluster of sterile flowers, (considerably elongated in fruit). Fruiting pedicels strongly reflexed or spreading, (slender or thickened), (0.7-)1-2.2(-3) mm. Flowers: sepals erect, oblong, 2-4 × 0.7-1 mm, (not saccate or urceolate); petals usually white to creamy white, rarely pinkish, (narrowly oblanceolate), 2.5-5(-6.5) × 0.9-1.1 mm, not channeled or crisped, claw undifferentiated from blade; filaments slightly tetradynamous, median pairs 3-4.5 mm, lateral pair 1.5-2.5 mm; anthers ovate, equal, 0.4-0.7 mm. Fruits ascending or descending (straight to slightly curved, sometimes subtorulose), terete, 2-4.8(-5.7) cm × 0.7-1.2 mm; valves each with obscure midvein, (glabrous or sparsely pubescent); ovules 14-60 per ovary; style 0.5-2 mm; stigma subentire. Seeds (brown), 0.9-1.5 × 0.6-1 mm. 2n = 28. Flowering Mar-May. Desert flats, gravelly areas, limestone rocks, talus slopes, shrub communities, hillsides, sandy banks, disturbed sites, grassy fields, ravines; 0-1400 m; Ariz., Calif., Nev., N.Mex., Oreg., Utah, Wash.; Mexico (Baja California, Sonora). Caulanthus lasiophyllus is highly variable in flower size, leaf morphology, fruit morphology (length, width, curvature, presence or absence of indumentum) and orientation, number of ovules per ovary, and plant height. 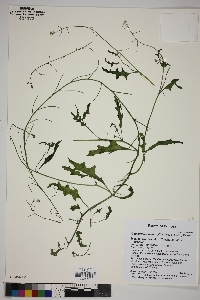 This species is badly in need of thorough studies at both populational and molecular levels, and it is very likely that some varieties recognized by E. B. Payson (1923), such as var. rigidus, may well represent distinct species or subspecies.